Dame Stella was born in 1935 and educated at Nottingham High School for Girls and Edinburgh University. After gaining a postgraduate diploma in the Study of Records and the Administration of Archives at Liverpool University, she worked in the Worcester County Record Office and the India Office Library, London. In 1965 she accompanied her husband on a posting to the British High Commission in New Delhi and, whilst there, she worked part-time for the Security Service, which at that time had an office in New Delhi. Returning to the UK in 1969, she joined the Security Service as a full-time employee. She worked in all the main fields of the Service's responsibilities - counter-subversion, counter-espionage and counter-terrorism - becoming successively Director of all three branches. 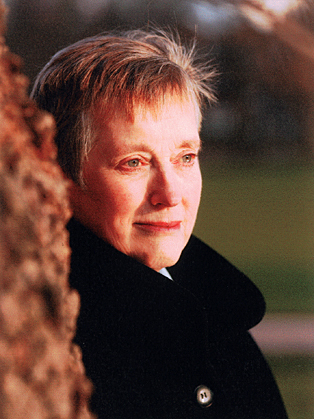 Appointed Director General of MI5 in 1992, Stella Rimington was the first woman to take the post and the first Director General to be publicly named. She retired in April 1996. Made a Dame Commander of the Bath in the 1996 New Year Honours List, she has Honorary Degrees from Universities including Nottingham, Warwick, Lucy Cavendish Cambridge and Exeter. Edinburgh University elected her “Alumna of the Year 1994”. Previously a Non-Executive Director of Marks & Spencer Plc, BG Group Plc, and an Associate Director of CPS, she was Chairman of the Institute of Cancer Research and Trustee of the Royal Marsden Hospital NHS Trust. Until 2001, Dame Stella was Honorary Air Commodore of 7006 (VR) Intelligence Squadron Royal Auxiliary Air Force and a Trustee of the RAF Museum. Dame Stella is known to billions of people worldwide as the role model for the character “M” played by Dame Judi Dench in the James Bond 007 films. It is rumoured that her own personal style influenced the film character of “M”. Her best selling thrillers, featuring MI5's Liz Carlyle are, At Risk, Secret Asset, Illegal Action, Dead Line, Present Danger, Rip Tide, The Geneva Trap, Close Call, and Breaking Cover. The Moscow Sleepers (the tenth in the series) was published September 2018. Dame Stella spoke at the end of our annual conference to an international audience of 600. Her speech about her life and career within MI5 was compelling and truly fascinating. The audience were completely engaged for the whole 45 minutes and gave her the biggest applause of the plenary. All in all, we were delighted – she was excellent! Dame Stella was a real professional, easy to work with and she followed the brief perfectly. Our client is delighted.